All common analgesics that can be freely bought in pharmacies and general retail outlets can cause (fatal) acute poisoning if an overdose is taken intentionally or accidentally. At lower levels, long-term chronic overuse can also cause organ damage. Analgesic nephropathy is a form of chronic renal disease caused by the excessive intake of analgesics, usually more than 2-3 kg, over a period of years. It is more common in women and in those with chronic headaches or muscle pain. It was first reported in the 1950's and in the mid 20th century it accounted for a significant proportion of end stage renal disease and renal transplants, particularly in Australia. The symptoms are initially inability to concentrate urine; later anaemia, hypertension and signs of renal infection, and in some patients renal colic and haematuria when passing sloughed papillae or secondary calculi. 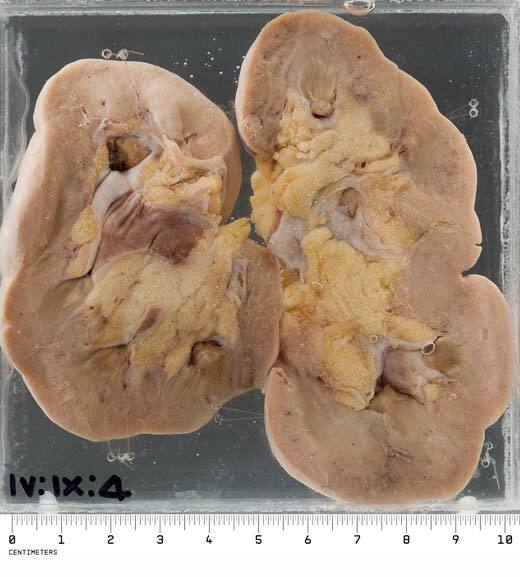 A small number of patients with analgesic nephropathy go on to develop transitional papillary carcinoma of the renal pelvis. The key analgesic implicated is phenacetin, a precursor drug of acetaminophen (paracetamol), but usually patients have used combination analgesics containing two or more of phenacetin, aspirin, caffeine, paracetamol and codeine. Phenacetin was banned by many countries by the 1980's and some researchers believe that analgesic nephropathy has died out with it, while others maintain that the disease can still be caused by other combination analgesics and will persist as long as these over the counter drugs are still sold. The right dose differentiates poison from remedy. The patient was a 48 year old woman who initially presented in renal failure as a result of analgesic nephropathy. A renal transplant was performed but massive rejection of the transplanted kidney occurred approximately 1 month later and the patient died of complications. On histology there was complete necrosis of the papillary zones, with loss of cellular detail and hyalinisation of the stroma. The interstitium of the overlying cortex showed fibrosis and contained an infiltrate of chronic inflammatory cells. There was extensive atrophy of tubules and early periglomerular fibrosis. Analgesic nephropathy comprises papillary necrosis with chronic tubulointerstitial nephritis. From experimental work, acetaminophen (metabolite of phenacetin) indirectly causes oxidative damage to tubular cells. Aspirin potentiates the effect by inhibiting prostaglandin mediated vasodilation, so predisposing the papillae to ischaemia. 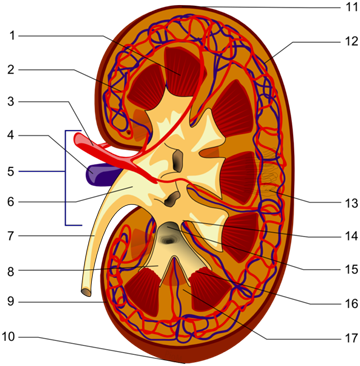 The tubulointerstitial nephritis is a consequence of impeded urine outflow. Paracetamol overdose is one of the commonest toxicological emergencies - acute ingestion of 15 or more tablets (≥7.5g) can cause severe centrilobular hepatic necrosis and often acute tubular necrosis. Supra-therapeutic doses of paracetamol(over a few days) are also a hazard for the liver. The specific remedy is acetylcysteine. Acute overdose or supra-therapeutic doses of aspirin and other salicylates result in metabolic acidosis, with a host of serious adverse effects. This can only be managed with intensive supportive care.